Marvel Studios’ AVENGERS: INFINITY WAR has set another milestone in Singapore’s cinematic history as the only film to surpass the S$14 million mark. It’s now at an all-time record high of over S$16 million and is still playing in cinemas for Marvel fans. 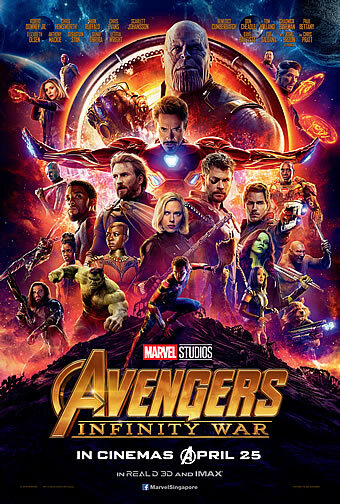 Currently in its sixth week of running, Marvel Studios’ Avengers: Infinity War holds several accolades including all-time #1 biggest film, all-time #1 Marvel Cinematic Universe title and all-time #1 biggest Disney release. Previous #1 all-time film was Marvel’s The Avengers with a total of S$13.7 million, while Marvel Studios’ Avengers: Infinity War took half the time to clock these figures at box office. MARVEL STUDIOS' AVENGERS: INFINITY WAR IS ALL-TIME BIGGEST MOVIE IN SINGAPORE! Following an astounding opening weekend success, Marvel Studios' AVENGERS: INFINITY WAR has set another unprecedented historical record in Singapore. In just two and a half weeks, Marvel Studios’ Avengers: Infinity War broke records to become Singapore’s #1 movie of all-time. Marvel Studios’ Avengers: Infinity War grossed S$14.3 million in its 3rd weekend and is the first film in Singapore history to surpass S$14 million. Previous all-time movie record-holder, Marvel’s THE AVENGERS, grossed S$13.7 million in 2012. The Avengers series currently holds the title of All-Time Top 3 films in Singapore. Marvel Cinematic Universe’s 19th film, MARVEL STUDIOS’ AVENGERS: INFINITY WAR, opens in Singapore cinemas to a roaring success over its opening weekend. In its 5-day opening weekend (Wednesday – Sunday), MARVEL STUDIOS’ AVENGERS: INFINITY WAR takes SGD6.12 million in box office sales, with a 4-day industry opening weekend (Thursday – Sunday) figure of SGD5.26 million, the biggest opening weekend of all time in Singapore. At SGD8.1M, MARVEL STUDIOS’ THOR: RAGNAROK holds the record for 2017’s #1 film in Singapore. MARVEL STUDIOS’ BLACK PANTHER currently holds the #1 title of 2018, thus far, at SGD9.7M. With our record-breaking opening weekend, MARVEL STUDIOS’ AVENGERS: INFINITY WAR is expected to surpass MARVEL STUDIOS’ BLACK PANTHER to claim the title of #1 film of 2018. The All-Time Top 3 films in Singapore are MARVEL’S THE AVENGERS (SGD13.73M), MARVEL’S AVENGERS: AGE OF ULTRON (SGD13.11M) and MARVEL’S IRON MAN 3 (SGD12.64M).